Modern Supply, an American Water Heater distributor for East Tennessee, provides plumbing contractors with residential and commercial water heaters. 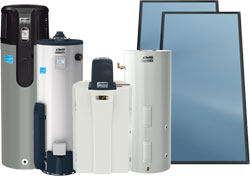 The extensive line of residential American Water Heaters include: electric, gas, hybrids, tankless, the high-efficiency Polaris and complete solar packages. American Water Heaters are American made in Johnson City, Tennessee. The American Water Heater High Efficiency units provide both high efficiency and easy installation. They’re ideal for homeowners desiring a reliable water heater. Available in a several tank sizes. American Water Heater’s high efficiency models help to reduce energy bills while being environmentally conscious. The product family includes: Gas, Power Direct, Power Vent, Hybrid Electric & Gas, and Solar. American Water Heater’s Hybrid models combine the best of conventional and tankless models. Electric Heat Pump units can save an average family approximately $360 a year on their electric costs. The Gas Hybrid delivers 90% thermal efficiency and eligible for the Federal Tax Credit. Polaris water heaters are designed to save money and water with their space heating capabilities, sturdy stainless steel construction and up-to-96% efficiency ratings. The Polaris is the perfect choice for homes performing multiple tasks simultaneously like dishwashing, showers, and laundry heating up to 386 gallons per hour. They’re eligible for the Federal Tax Credit. The Solar Electric Packaged System from American Water Heater provides everything needed for a comprehensive solar installation allowing for quick and easy specification and installation. Tankless water heaters from American Water Heater provides instant hot water at preset temperatures. It’s important to work with a reputable contractor for determining the correct size for your home. Tankless systems are Energy Star qualified. 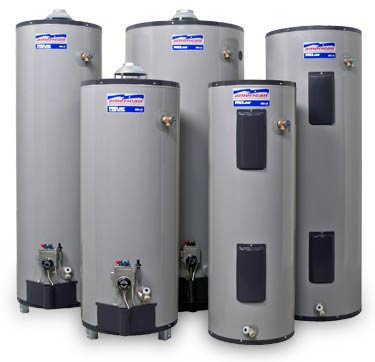 American Water Heater’s commercial units are built for durability, efficiency and demanding use. From light commercial gas units to heavy-duty models built for high-volume and high-temperature water, Modern Supply can provide the unit perfect for your application.